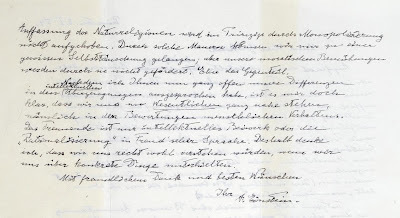 One of the highlights of Bloomsbury Auctions’ 25th Anniversary sale on 15th May 2008 is an unrecorded letter from Albert Einstein, in which the theoretical physicist wrote of his religious beliefs (lot 303). Although Einstein emphatically rejected conventional religion, he was affronted when his views were appropriated by atheists, whose lack of humility he found offensive. Einstein’s letter is expected to fetch between £6000-8000 at Bloomsbury Auctions, 24 Maddox Street, London W1S 1PP (Tel: 020 7495 9494 email info@bloomsburyauctions.com) on Thursday 15th May. The sale of the letter would be a fitting way to celebrate Bloomsbury Auctions’ 25th anniversary; today it sells more books than any other auction house in the world. - was more than 25 times the pre-sale estimate. Bloomsbury did not identify the buyer, but managing director Rupert Powell said it was someone with a passion for theoretical physics and all that that entails.